Creative D5 Air brings AirPlay to wireless speaker dock range | What Hi-Fi? Creative has added an AirPlay model to its ZiiSound range of wireless speaker docks. 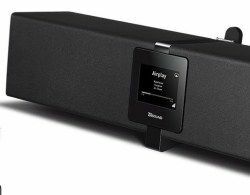 Joining the Bluetooth ZiiSound D5 and the aptX Bluetooth ZiiSound D5x, the new ZiiSound D5 Air supports streaming from any iPad, iPhone, iPod Touch or iTunes on a Mac or PC. We were given a briefing on the D5 Air ahead of its scheduled release at the end of September 2012. The speaker keeps a similar design to previous models but adds a 2.4in colour LCD screen for album artwork, track information and more. Creative has released an EasyConnect app at the same time, which once downloaded allows you to simply transfer your wireless network settings from your device to the D5 Air speaker, making set-up even easier. As well as wireless music streaming using AirPlay, there's also an iOS dock for connecting Apple devices such as the iPod nano and iPod classic. The dock won't of course support the new iPhone 5, however, though the infamous adapter should do the trick. The Creative ZiiSound D5 Air is due out later this month.